Annie Jaffrey: From Me, To Me. In life, we all go through issues with our friends and our significant others - it's inevitable. We all have relationship issues we wish we didn't. But even during the toughest times, I always remind myself that I am the most important person in my life, and even though I compromise and sacrifice for people I love, I never want to forget myself. My mom and grandmother always taught me to be independent. Every girl loves to be treated nicely (and deserves to if they're a good person), I love romance and flowers and little thoughtful gifts as much as the next. But something which came to my attention recently is, if you want those flowers and if you feel like those flowers will make you feel better, go buy yourself some flowers - don't wait around for someone else to bring you happiness. If you want that beautiful car or those new shoes, work hard and earn money to buy it for yourself. Taking care and providing for yourself is one of the most powerful things you can do in life, especially as a woman. You are amazing love you! The flowers are beautiful Annie, you deserve them! I hope you're ok and I'm glad you're looking after yourself, I hope you start feeling like yourself again soon. Beautiful post Annie. And flowers! They look amazing! I emailed you a couple of days ago because i noticed you havent been posting anything but i'm so happy that even through tough times you always find yourself in the end. Its funny i was thinking about that similar idea today too! About if you want something go and get it. I fought through dark times and I'm stronger and happier than ever. We should all shine brightly even on the darkest nights. I love you so much. You are truly amazing! Hope you feel better soon .x. Wonderful flowers! Looks sooooo much like spring! No sabia que tantas personas se pudieran sentir como yo en este momento y te agradezco infinitamente por recordarme que realmente que lo más importa en la vida es cuidarse uno mismo y no poner a los demás en primer lugar, gracias por hacerme sentir que yo tambien merezco ser importante, espero que te sientas mejor y seguir siendo una fuente de inspiración tan grande como lo eres ahora. I hope you feel better soon Annie! I love your philosophy on life. So inspirational and independent. You are the only person who can truly know what you want in life so I love this post. Thank you for being you! love your topic, it is absolutely true in real life, dun rely on ppl to give u happiness esp gals tend to be feeling insecure easily and always try to get attention from others, esp guys..
Stay firm gals.. !!! we are strong!! get well soon Annie.. and cant wait to hear from you again..!!!! I always appreciate your positive vibes. You make me want to be more positive instead of focusing on what's wrong lately. Annie this blog really really touched me tonight. I just got done having an emotional conversation with my mom about my on again off again exx boyfriend who she's disliked since day 1. Afterwards I went on my laptop and decided to see if you've posted anything recently. This really hit hard and I will remember your thoughts and wisdom always. It's so true, it's making me realize I need more work on my self esteem than I ever imagined. I need to quit spoiling myself with material things thinking they will make myself feel better. I shall make myself earn the useful things that I really want, and quit settling for crumbs (certain guys) when I deserve the whole piece of the pie(metaphorically speaking). You motivate me to grow more healthy, independent, and less lazy. I admire your motivation and strong positive vibrations very much. Muchos Gracias, Much love from Fla!!! Your the best! 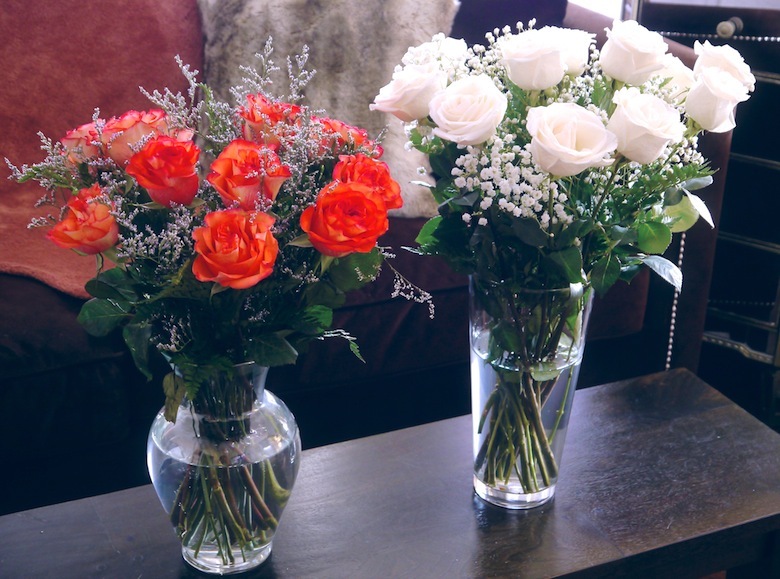 I love to get myself flowers as well. I hope you feel better soon, remember 'this too shall pass'. I do the same for myself.. get well soon. It looks beautiful! very nice post. 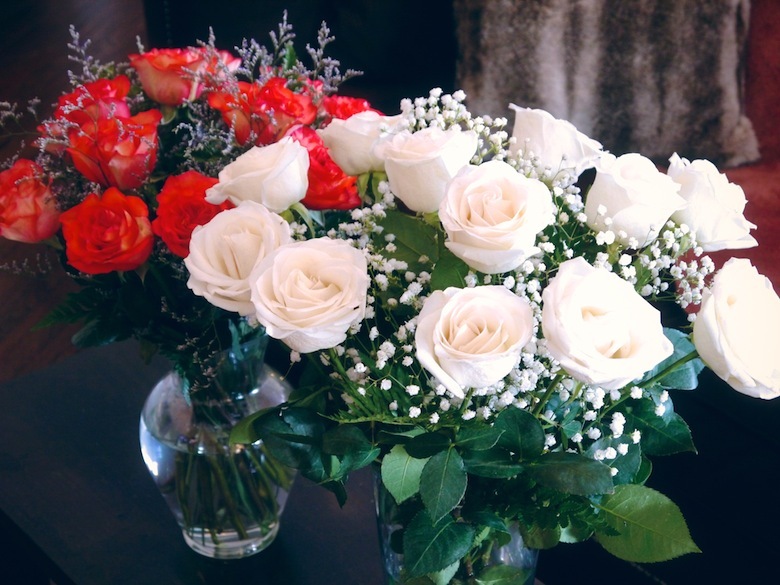 Thank you so much for your inspiring post...I just broke up with my boyfriend of 9.5 years and I was thinking to myself "now who will buy me flowers?" You've just proven that I can buy them myself!! You've made my healing process a little easier, thank you Annie! You deserve to be happy! I like to read your blog .. and always I keep in mind your advice! Behind a beautiful woman, always has to be a strong personality! Annie you are amazing, never forget that!! Life is so short, be happy and forget about the sadness!! i feel like i got flowers today just looking at all thes pics--thanks!! much love! thank you, thank you for this amazing post, I needed it :) i'm dealing with something similar... i'm gonna read over and over. <3 hope you feel better soon :)) send u lots of love..
Hope you feel better soon Annie! The flowers look beautiful, and this post is very inspirational. a great post. towards the end of my relationship I forgot to put myself first. I now I have to pick up the pieces - a long and painful process. you are absolutely right. we have to make ourselves happy. everything else will follow! Beautiful Pics!!! I love this!!! I just want to remind you that you are great motivator and inspiration of me. So often, when I am under the weather, I would just open your blog and browse through your motivational section, of watch some of your videos and this brings me so much enthusiasm and power, woman power! I hope you will be feeling better soon. I send you my love, we are all here for you! You're inspirational even when sick! That's a real gift :) hope you feel better soon. Lots of love and hugs from New Delhi. Thank you for your motivate and inspirate thoughts. You always make my smile and every time when Im watching your videos in youtube or reading your blog , I always thanks god that I finally found super positive person. I love you some much and I hope you feel better soon. First of all i hope you feel better soon, and this was very inspirational and its true the only person the matters is you and if your happy automaticaly your day will be like 100% better opposed to when your feeling sad. 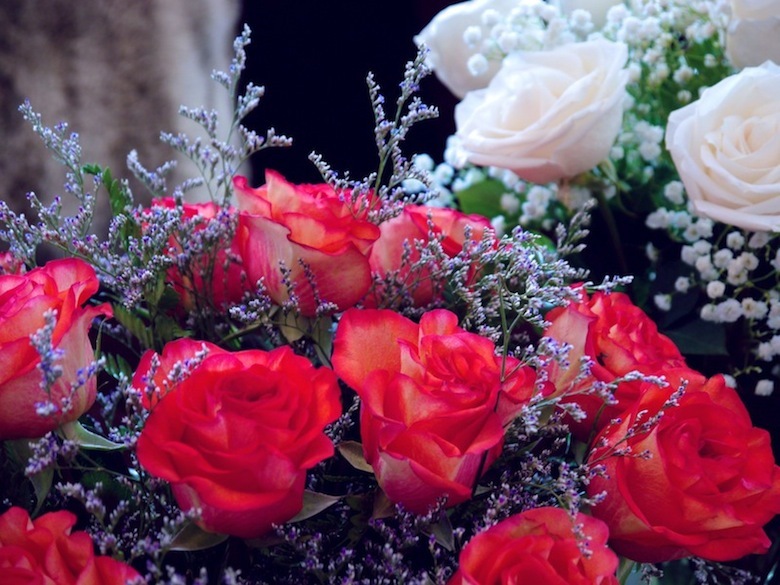 but what i feel about getting these roses and taking care of them is like getting a partner and getting care of him for me, roses are different.. also people..
flowers are different, also people.. Thank your for these wise words, I hope you feel wonderful again! I wish you all the best, Annie! Get well soon beautiful! Thank you for the inspiration. What an inspiring post, Annie. hugs and kisses from LA, Cali. Ton blog à traversé l'océan, Je te suis depuis la France ! I usually go to your channel when I need some motivation. But this time it is you who needs it. It is unfair to see someone like you not feeling so good. You have such an AMAZING spirtit! You are not only beautiful on the outside but on the inside as well. Dont ever let anyone bring you down. You deserve ONLY the best! by the way I love watching your videos. I don't follow anyone else because it seems a waste of time. But I like yours because even though you are 3 years younger than me you are mature and never come off as conceited. You always show humility and a genuine interest to help us women feel better. I wish you the best in life Annie! I lived in Portland, OR, for a few months by myself. I loved seeing all the flower stands out and so every week, I bought myself some flowers. I didn't want to be the only living thing in my apartment. 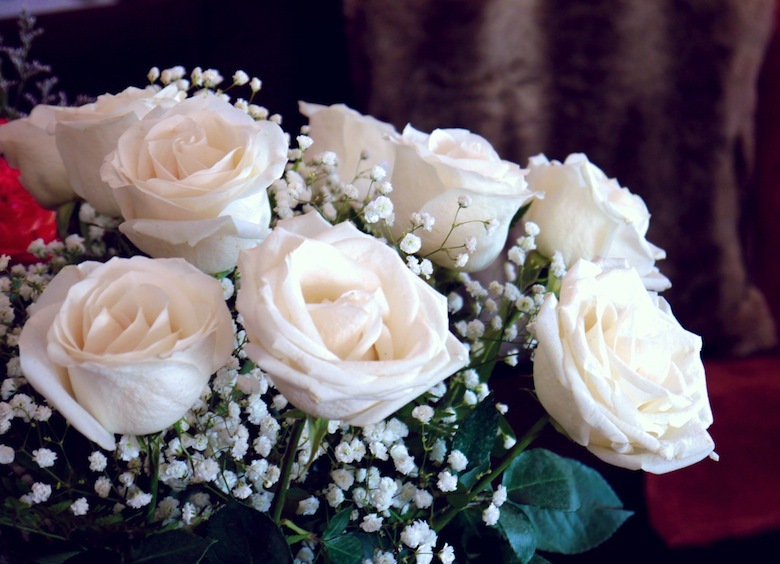 White roses are my favorite- nice choices there, Annie! Hope you get better soon! You are the most independent woman I know. You are what we all here in your blog aspire to be like. I just want to say that even though you are under the weather, you are strong! Strong and beautiful and intelligent and no matter what happens you will always come back on top! Your blog was so inspiring I got tears in my eyes because this is one of the hardest lessons woman have to learn. Every one helps build who we are, but ultimately we are our best architect Annie. Sending you get well hugs! P.S I will be sending myself flowers very soon. one of the best posts you've ever written!! The more I watch your videos and read your articles the better I feel ! Not that I'm having a hard time or anything but I just don't feel motivated to do anything at all so I often eat my feelings or lay under my blanket for like 4 hours which I know isn't that good... Anyways thanks to you I tend to get up and take care of myself by exercising or drinking water or even listening to my favorite music, and it's all because your words give so much motivation and confidence. I think I went a little off subjet or something but this is just to remind you that you're the best ! I wish you will feel better soon and that you'll fix all your issues. Annie, go for a run and you will feel much better!!! :) I always do that when I am sad, unhappy, angry, etc. You are beautiful and strong, you inspire millions of people (me included), hope you'll feel better soon!! Lots of hugs and kisses from Geneva!! Don't let anyone get you down, ever. You are worth so much more than any person who makes you feel bad (in any way)! You have inspired me with your videos and blog posts so so much! And it is VERY hard to impress me, believe me, but you did it! And i started to take more care of my self and get fit and healthier again. You reminded me of who i truly am! You're absolutely right about women and our independence, I could not agree more. I always tell myself to depend on no one else but Me, real happiness comes from within, not from anybody else. Though I would like to take the opportunity to point out that sharing joy, mutual affections, or even sadness with people around us is one of the best things in life, as you always say, we should surround ourselves with people that love and cherish us, not those who simply tolerate us. Treat ourselves right, because if we won't even do that for ourselves, no one else will. Don't give in just yet, there are beautiful things lying ahead of you Annie! My condolences to you and your family. I know you don't know me, but I wish you and your family well during this difficult time in your life. My father died of a heart attack when I was 11, so I can only imagine what you must be going through. You deserve all the happiness! The key is to make yourself stronger and stronger! I hope your heart finds peace and tranquility. Life is a test, and success lies in earnestly seeking eternal bliss. Wishing you the best on your journey. Annie, I visit your blog every day and I have to tell you that I consider you my best mentor, my inspiration. Although it does not personally know you know how important you are to me. We all have our days of downturn, but you know you have a lot of support out here. I send you all my love and energy from across the pond, from Spain. i do miss you Annie ! I follow since 2 years and I love you sooo much Annie !!!! Hey! I was just wondering, do you still do your at-home - facial routine? Do you think you could like make a video on what you do before you go to bed, like nightly skincare routine. I know you postet you favorite skincare products, but can you like go through it one more time, like witch one you use every night. And aslso a video on what you do on a weekly basis, like witch days do you do your honnie mask, at witch days do you do your (if you still do it) at home facial - routine. This was long and not very easy to understand, but I hope you understand and hope you respond to this on you youtube-channel. Thank you very much! I really love your blog and youtube channel, it has really helped me and inspiered me a lot. Annie - you are so incredibly inspiring. Hoping that you will have a truly restful week! Annie you are such a beautiful person. Whatever you are going through I hope from the deepest part of my heart and soul you will be able to get through quickly and come out as a better and stronger woman. I adore the message you have given us all. You are right; YOU are the most important person in YOUR life. Knowing this will lead you happiness and help you surround yourself with good people. I hope you find peace soon. I was once told that flowers are a reflection of the giver's sould, and your's is beautiful. Thank you Annie! This is excatky what I needed to hear! Hope you ffeel better soon! You're inspiration for thousands of girls around the world. I know that maybe sometimes we feel down and there're no words that calm the pain...but Hold On Pain Ends (HOPE). Thank you Annie for showing me how important is self loving and self acceptation. I admire you a lot! Be strong! Everytime I feel a bit down and looking for strenght to carry on with my life, with my career I read your blog, you are very special, you deserve the best! By the way, your roses are so gorgeous!! certainly they are Ecuadorian! (in my opinion, Ecuador produces the most beautiful roses of the whole world :)!! I love that you buy yourself flowers! I have a boyfriend but we were long distance so on occasion I would get flowers from him but I always buy myself flowers. It reminds you that you cherish yourself and makes my tiny apartment look beautiful. You go Annie for buying yourself flowers!